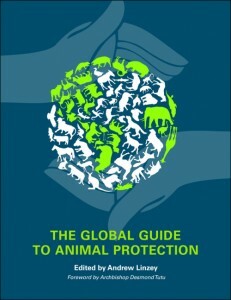 The Global Guide To Animal Protection. Edited by Andrew Linzey. University of Illinois Press, 2013. Andrew Linzey, tireless campaigner for animals, advocate of Christian vegetarianism, and director of the Oxford Centre for Animal Ethics, has edited a marvelous book about animals worldwide. The Global Guide to Animal Protection is an encyclopedia of animal issues that is truly global — and we’re not just talking about on land, but in the sea as well. If you live with a dog, or have been to a PETA demonstration, or try your hand at preparing vegan meals, or have written letters opposing “Sea World,” or have joined a vegetarian group, then this book will likely tell you quite a bit in connection with any or all of the areas of concern to which you have just barely been exposed. This quite ambitious project is astounding in both its breadth and depth. I consider myself a fairly well-read vegan activist, but I could scarcely open the book at random without being confronted with a wealth of detail that I was previously unfamiliar with, both in terms of geographical areas and types of animals involved. The book is divided into seven major sections, together containing over 190 separate essays. Two sections deal with free-living animals, in the oceans and on the land. Two sections deal with “domesticated” animals (companion animals, and animals for food, research, and entertainment). One section concerns the history of the animal movement and global perspectives on that movement; another section discusses “changing perspectives” in science, religion, law, and philosophy. The final section discusses “animal friendly living” — how to take action, and how to live the compassionate life (e. g., by going vegan). To give you an idea of what is covered, here are just a few of the countless things I learned while browsing through the book. 1. Dolphin rehabilitation consists mostly of doing nothing — in deliberately not training the dolphins to be released. 2. “Tolstoyans” were responsible for the promulgation of vegetarian ideas in pre-revolutionary Russia. 3. While there are laws to protect cows in India, the cows who are slaughtered there are subjected to unbelievable cruelties. 4. Whale strandings are often due to the use of military sonar. 5. The celebrated advice of the Buddha allowing monks to eat meat not specifically killed for them was likely added many years or decades after the Buddha lived. 6. In Norway it is illegal to castrate pigs without anaesthesia. 7. In the last decade, there has been an exponential increase in the trade of primates for research. Several things surprised me this book. There is an extensive discussion of free-living animals, both on land and in the sea. Human dominion truly extends over the whole earth, and there is scarcely a single square inch on the planet that has not been exploited by humans in some way. “Humans are all over the place,” says Marc Bekoff (p. 69), in what is surely an understatement. The “traditional” areas of activist concern — animals for food, research, and entertainment — occupies just one of the seven sections in the book. There are also essays on the humane movement in Canada, grieving for companion animals, sea turtles in the Mediterranean, roadside zoos, elephants, the WTO and animal issues, microchipping, canine profiling, the feminist ethic of care, transgenic animals, and dozens of others. The list goes on and on. He then proposes an “International Cruelty Tribunal” and an “International Cruelty Register” to identify cruelty and take action against governments which support cruelty. A number of well-known authors contributed to this volume. Archbishop Desmond Tutu wrote the foreword to the book, and Andrew Linzey himself authored or co-authored about a dozen or so of the essays, including introductory essays at the start of each section. There were numerous authors whom I had encountered previously — Jane Goodall, Marc Bekoff, Karen Davis, Samantha Jane Calvert, Norm Phelps, Stephen Walsh, and Roberta Kalechofsky, were just a few of them. But I also read many articles which thoroughly impressed me by authors I had never heard of. The authors generally covered their subject in some depth — these are not “fluff” articles mostly with things you already knew. It’s not totally without controversy (one article ventures into the hotly-debated topic of homeopathy), but the overwhelming weight of the volume is just straightforward reporting and analysis. Linzey, as editor of this volume, did a really outstanding job, both in organizing the overall material and in selecting the authors. 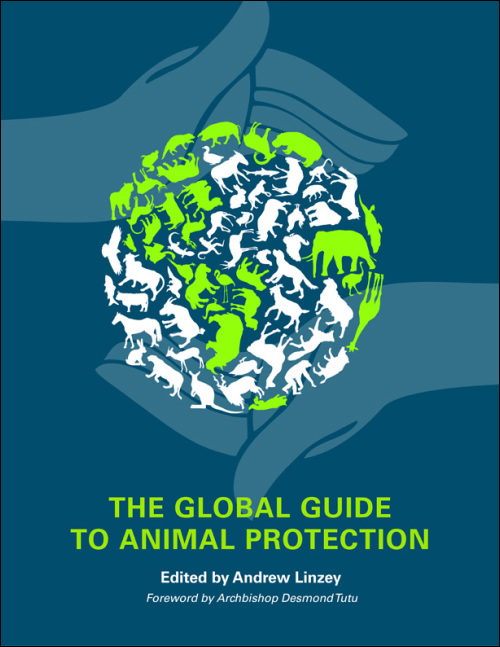 If you are concerned about the impact that humans have on animals, or the efforts to protect animals, this volume is truly indispensable. I hope that its impact will be to further a truly international movement to protect animals. This entry was posted in Animals and ethics, Nonviolence, Religion and spirituality, Vegetarianism / Veganism on February 3, 2014 by Keith Akers. Sounds great! I ordered a copy for my kindle. There are several interesting fairly new books out from a Christian animal rights perspective – including books by Richard Baukham and David Clough. Also Scientific American has an issue out about amazing new research on chicken IQs. Vegetarianism and Christianity — are they compatible? Will the USA survive until 2026? Defining veganism: is veganism ambiguous? What does the Decline of Christianity Mean? Soil Erosion — is anyone paying attention? How can we ask them not to eat meat? Are the Economists Hopeless on Environmental Issues? “Eating at the Table of Gentiles”? Was there a historical Jesus? This Just In: Ancient Temple was a Slaughterhouse! Vegetarianism and Christianity — why don’t they mix? Why Does Whole Foods Sell Meat? This Just In: Jesus was Married! What is it with Buddhists and the First Precept? “Be the Change” — where did this saying come from? What’s the Best Vegan Approach? Is the Gospel of Thomas Vegetarian? The Economy and the Environment — Can We Have Both? Climate Change: are we doomed unless the world goes vegan? Methane — a bigger problem than we thought? “Year of the Dog” — a good or a bad movie? What are Humane Standards for Urban Goats? Is the Weston Price Foundation an Astroturf Site? Grass-Fed versus Grain-Fed Beef: Which is worse for climate change? Does Grass-Fed Beef Help Sequester Carbon? Livestock The Main Cause of Global Warming? “Be the Change”: Did Gandhi really make this statement? McDonald’s Lawsuit — What’s the Story? Is The Lord of the Rings Christian?